You know it, I know it, only maybe the Purple People Eater doesn’t know it: all digital music players out there have pretty much the same features. Don’t get me wrong. Some have FM, some don’t. Some play more formats than others, etc. In the end though, they’re music players… and that’s that. The BF-10 from i-Bulldog is not different. It stands out only because it looks quite pretty. And that, as has been said before, at OhGizmo, counts for quite a bit. For the record though, feature wise, it’s got what looks like a four line monochrome LCD, FM tuner, voice recorder, customizable equalizer and uses a single AAA battery for juice. Sizes go up to 1Gb, and it’s got Korea only written all over it. Oh I’m glad I’m not the only one! I can’t find it either! I’m going to call The Source (where I purchased it) to see what they suggest. hi I’m having trouble deleting a file off this thing. I am having the same trouble and have contacted the people at IMPO america because when I went back to the source where I bought it they told me that was the page I was to download the software from but can not find it. If anyone knows please tell me. also didnt recieve cd.. nobody knows where? So no one got a installation cd even though it says it comes with? I think we’ve all been serioulsly ripped off! I also didn’t get a cd, the guy at The Sourse also told me to go to the IMPO America website, and said that i could find the software to download the 2 months of free music!!! I’m goin there somtime to ask him what’s up!! By the way, did whoever got there i-bulldog from The Source, get it from the Deerfoot Mall? After buying the iBulldog (also from the source) and also being told to go to the same website for my firmware update – I’m in the same boat. However, under windowsXP the mp3 player pops up and automatically recognizes. HOWEVER… make sure all other USB drives (flash or HDD) are disconected and or turned off. The data transfer rate drops through the floor if anything else is running on the USB bus. (5 hours to transfer a song). 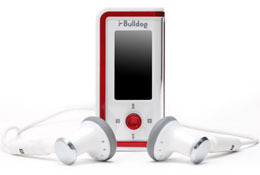 http://www.ibulldog.net (recommended for firmware and software updates in the manual) is a dead-link. Hurray for the internet age. Best of luck to anyone experiencing problems. I agree i also didnt get one IF ANY 1 CAN HELP PLEASE, my bf10 no only has 900mb memory now and it used to have a couple gigs whats with that?